Challah is a traditional Jewish bread. 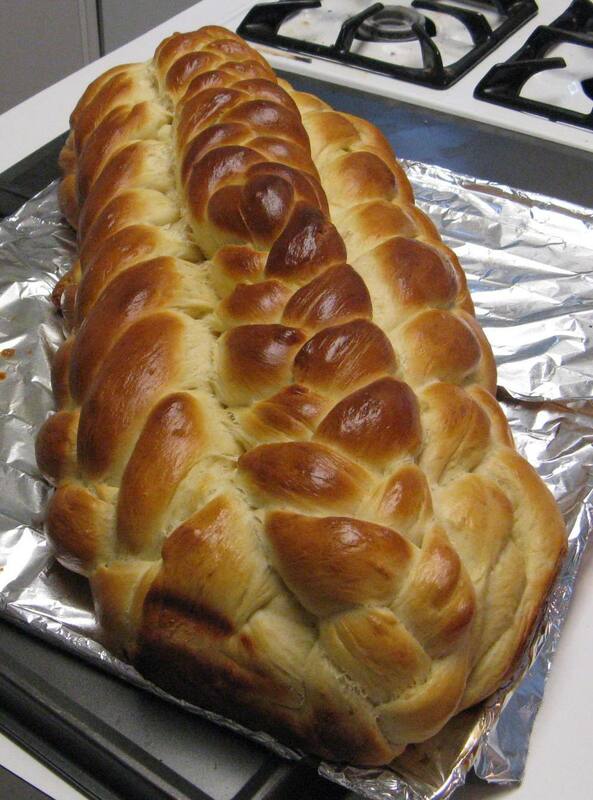 It is a component of Sabbath and holiday meals and is also served at weddings, bar mitzvahs and brises. As the readers of this blog know we recently welcomed a new Lansey into the family (who also happens to be a Lansey Brother with his big brother Moshe) and yesterday was his bris. 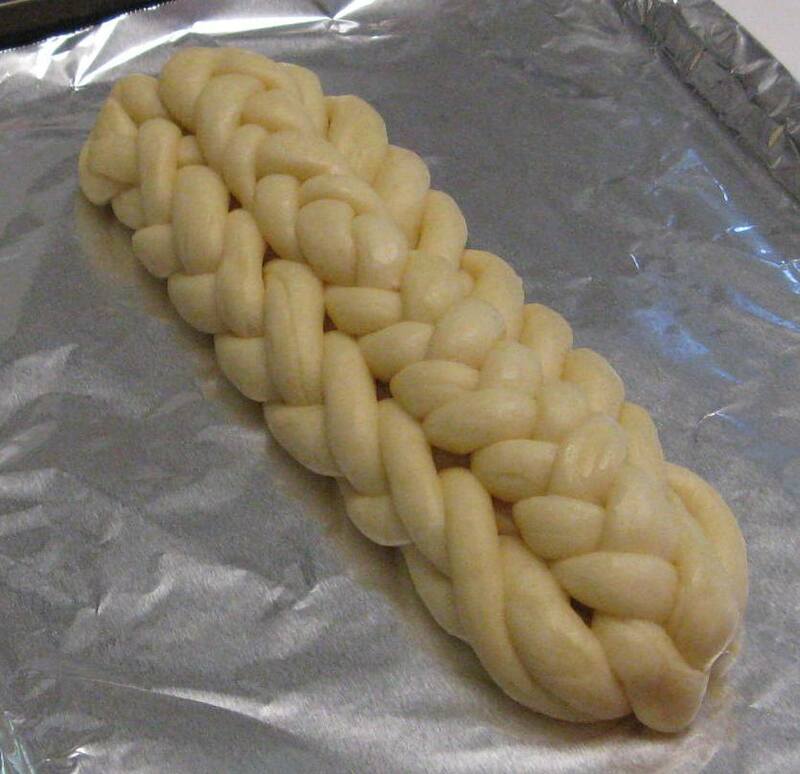 Stacy had asked me to bake a challah for the bris and I did. Take the eggs and place them in a warm cup of water (before you cracked them of course), I tend to put in new warm water every couple of minutes to make sure the eggs get warmed up. Warm the water up in the microwave (45-60 seconds in the microwave for me, you will need to figure out this time yourself for your microwave), you want it warm but not hot. If the water is to hot it will kill the yeast. I heat the water up by itself so that it is easier to check its temperature without getting my finger covered in oil. While the water is warming up mix two cups of flour with the rest of the dry ingredients (keep the rest of the flour separate). Make a depression in the center of the dry ingredient and pour the water and oil into it and mix thoroughly. With the eggs warmed up crack them into a cup and lightly beat them together. Pour the beaten eggs into the dough and mix. After the eggs are worked in add two more cups of flour and mix, you should still be able to do this with a spoon. Now its time to start getting your hand dirty. Add one more cup of flour and start kneading. 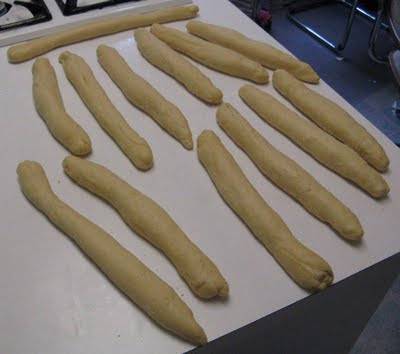 Then keep adding bits of flour while kneading until the dough is done, this will likely happen before you use all 6 cups of flour so don't try and force all the flour in. The amount of flour you need will vary based upon the brand of flour whether it is bread or all purpose and even the humidity in the air. The dough is done when it is tacky but not sticky. This means that you can poke the dough and it will feel sticky but when you pull your finger out you don't have dough stuck to your finger. Knead for a couple more minutes. Take the dough and form it into a ball with a tight skin and put it into a bowl more than two times its size (so that it has space to rise). Cover the bowl with plastic wrap and place it in the fridge. To those of you who have had experience baking bread the last step probably seems odd. 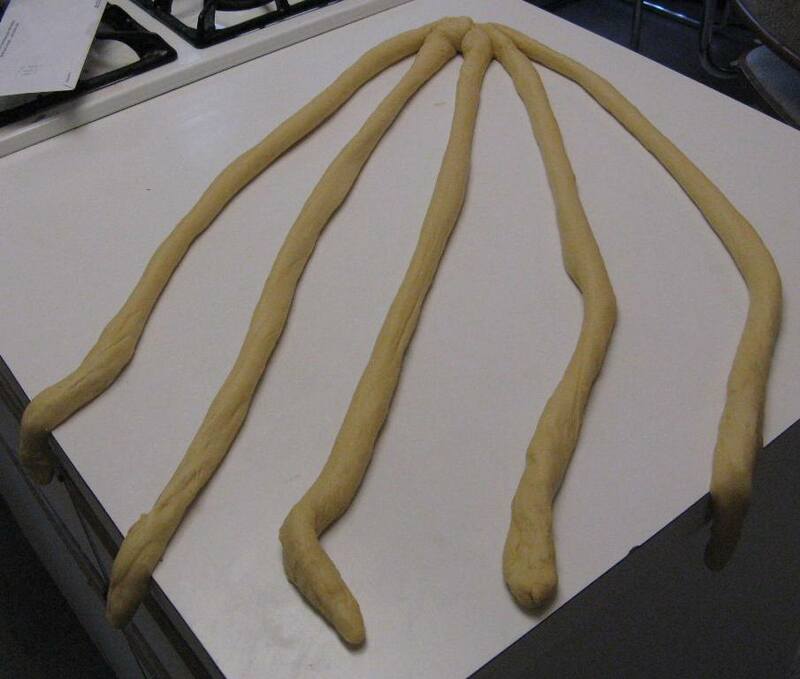 Why would someone put bread dough in the fridge right after it is made. Well the dough will still have enough heat in it to rise properly and then the fridge will cool it down and put the yeast to sleep. Letting the dough sit for a long time in the fridge allows enzymes in the dough to break down the starches. 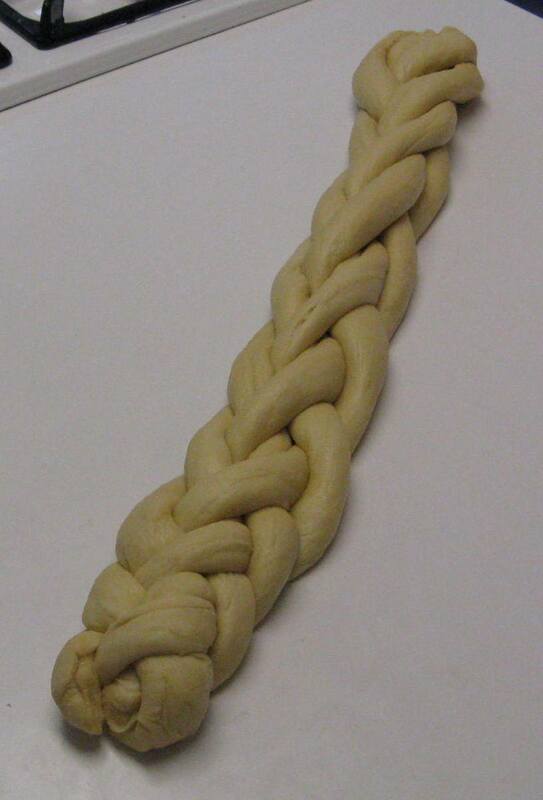 This results in a number of subtle flavor compounds that you normally don't have in bread and also reduces bitter yeast flavors. 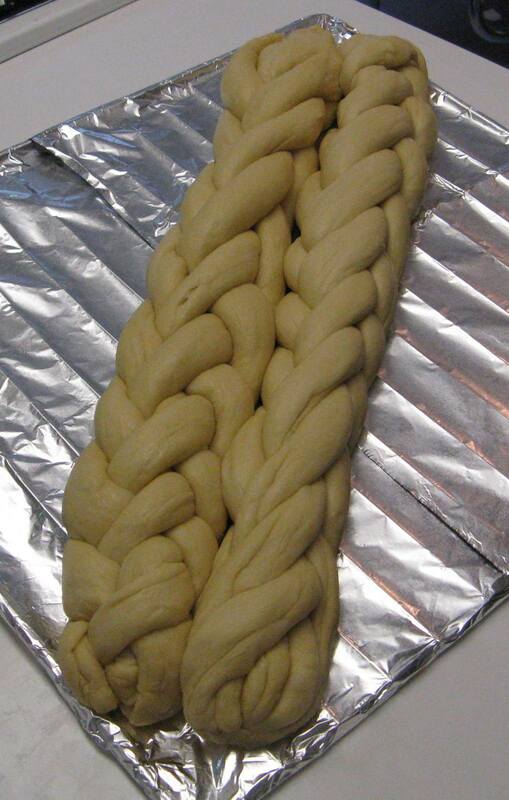 You can leave the dough overnight or up to 3 days. Once you have waited however long you will wait it is time to shape the dough. 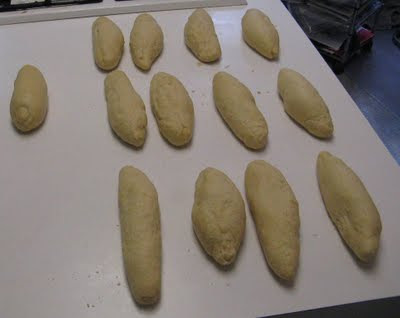 Take the dough out of the fridge and lightly force the dough down, NO PUNCHING. Punching the dough will force all the little bubbles in the dough together and you will end up with a leaden loaf, so be gentle. At this point shape the loaf however you want. This batch will result in two large challahs or four smaller ones. Different shapes will result in different textures. If you want to get a nice bready texture and don't want to start fiddling with braids just knead the dough for 5 minutes before shaping it into a simple loaf. To glaze take one egg and mix it with two tablespoons of water and it will become very easy to brush onto the challah, just like painting. 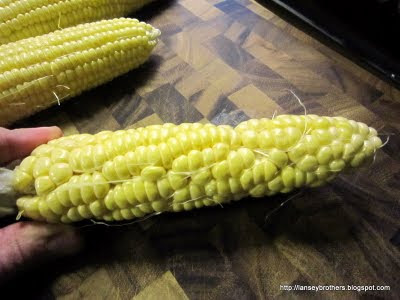 Bake at 350 degree until it is golden brown and when you knock on it you get a hollow sound. 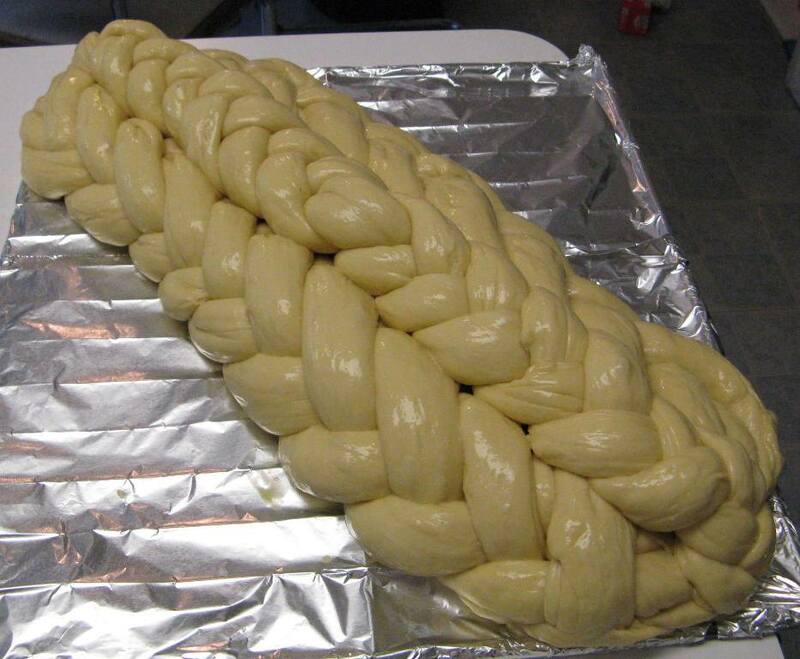 For Chanans bris I made a super large challah, with a 2.5 times recipe (it weighed in at 6.25 pounds before baking). 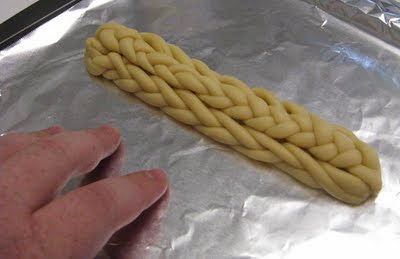 This is not the big challah of course, this was the small scale model I made to test if my design would work and look nice. You can see my hand for scale. This is what it looked like after it rose. 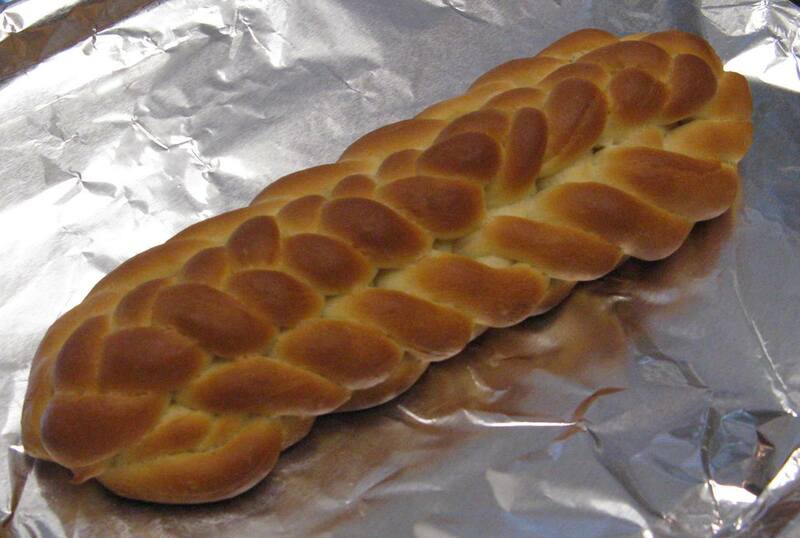 And this is what it looked like after it was baked, perfect. First I weighed all the dough on my handy surplus lab scale (very, very, very well cleaned of course). 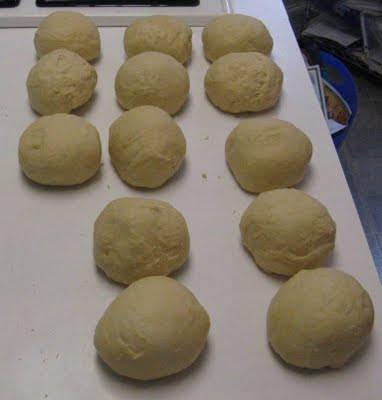 Then I made 13 dough balls that all weighed the same. It is hard to roll out the snakes from a ball because as you work the gluten it stiffens up. 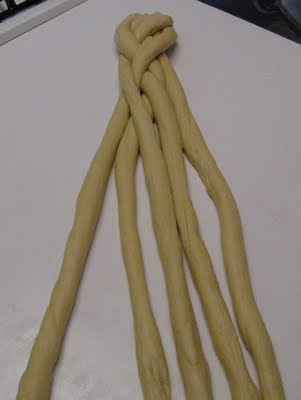 So you have to do it in stages with breaks in between to allow the gluten to relax. With this many braids I was able to roll them all out bit by bit going around from first to last and then back to the first. 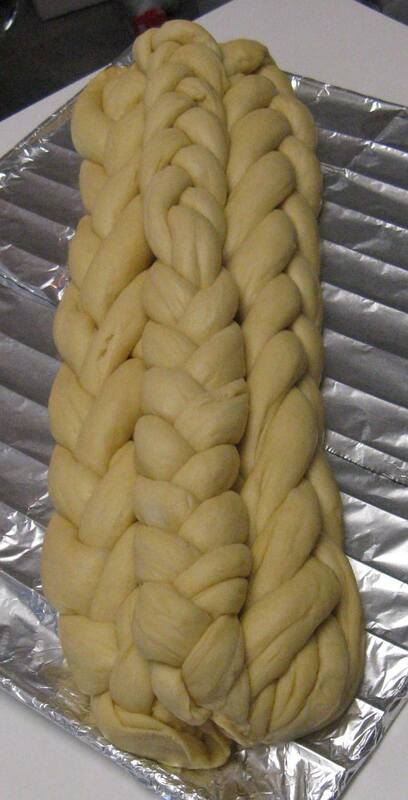 I did a 5 braid challah, the pattern is 2 over 3 then 5 over 2 then 1 over 3. Second one done and put next to each other. Then I made a simple 3 braid challah. And put it on top. Then I let it rise. After it rose I glazed it. My grandfather was a dedicated and talented Jewish educator; he was a soft spoken man who seemed to have endless patience. He was the principal of a few Hebrew Schools, who always put students’ needs first, and was a fluent speaker of Hebrew. He taught me and my brothers to lein our Bar Mitzvah portions, and didn’t even loose his cool when Aryeh announced a week or so before his Bar Mitzvah that he wasn’t going to do it. We hope that Chanan will share his love of learning, dedication to others and his tremendous patience. Chanan was born a week late, so clearly he has already been honing this skill. Although the name “Chanan” is not exactly the same as Chaim, we feel that the name captures a major aspect of my grandfather’s personality, and also reflects our appreciation to God who has been most gracious. The biblical Azarya -- “He who God helped” -- was forced to walk through a burning furnace when he refused to abandon his beliefs. He did so with ultimate confidence in God’s help and escaped unscathed. Similarly, we hope that whatever difficulties Chanan Azarya will face, he will rely on God for support. It struck me recently that we don’t say tachanun at a bris. To be more precise, the Shulchan Aruch’s statement about the minhag not to say tachanun at a bris is somewhat vague, but the Rema clarifies that it’s specifically at the shul where a bris will be, only at shacharit, and has nothing to do with where the bris-related people are. This is fairly strange, as it seems that the “happy cancels tachanun” thing generally isn’t so limited. A groom, for example, cancels tachanun at any place he davens for a whole week after the wedding. We go a whole month without tachanun around Pesach, and large stretches of time around other holidays. Yet, the bris’s ability to cancel tachanun is localized in location and time. Even though the MB disagrees, and increases the strength of the tachanun cancelling rays to include a larger set of bris-related people, he still seems to agree that it’s localized to shacharit of the bris. I think these strangenesses can be understood by looking carefully at the content of tachanun. It’s really about looking at our nation’s past -- it being filled with many periods of great struggle and difficulty -- pointing out that in spite of all that we’re still, as a nation, devoted to God, and that in light of that He should continue to save us. On Tisha Ba’Av, in the depths of our despair, we’re unable to see the positive -- that we survived -- and certainly unable to look forward to a more hopeful time. We can only cry out from the depths of despair and ask “Eichah?” -- “Why?” It doesn’t fit with the theme of the day to look to the future when we can barely comprehend the vast troubles of the present. Tisha Ba’Av doesn’t cancel tachanun because of happiness, but because of ultimate despair. Bris, on the other hand, is the ultimate trump card -- it’s almost tachanun on steroids. The brit milah that we just brought our son into makes tachanun look like wishy-washy nothingness. Here we are, joining our son into the covenent made with Avraham at the start of our nationhood. We, as a people, have persisted in doing this brit throughout all the troubles of history -- all those dark times tachanun recalls. And yet we don’t despair; we embrace this Brit, literally carving it into our flesh, confident in God’s continued partnership in the covenant in the future. The simple words of tachanun look plain silly compared to this! We don’t say tachanun at a bris because we are doing something which is orders of magnitude more powerful than it! Instead of cancelling tachanun because of happiness, like around the chagim, or despair, around tisha’a ba’av, we cancel it with intense confidence that God will uphold his end of the Brit, now that we’ve upheld ours. Pirkei d’Rabbi Eliezer comments that Eliyahu Hanavi -- the prophet Elijah -- who at one point doubted our people’s dedication to Brit Milah, is given a seat of honor at every future milah to witness that we have continued our end of the brit throughout history. He is witness not just to individuals who uphold the brit, but to communities who come together, braving the detritus of hurricanes in this particular case, to celebrate our nation’s continued dedication to God and our Brit with Him. We recognize God’s graciousness in having a healthy baby and for all the good we have in our lives. 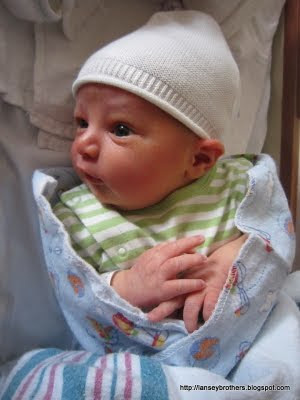 We hope that God will help our son throughout his life. And we have ultimate confidence in our Brit with God that it will continue to stand with us personally, our families, and as a nation, for all future generations. 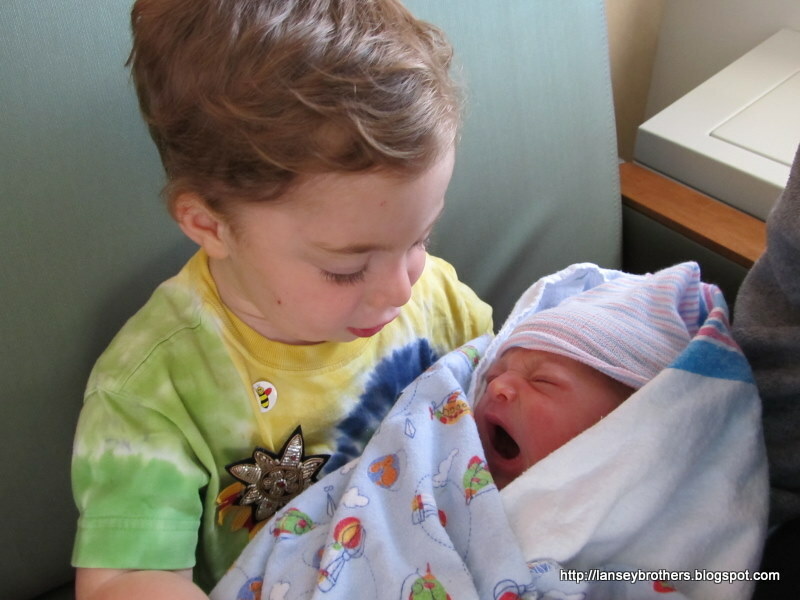 On Monday, Stacy gave birth to a 9lb, 10oz baby boy. Stacy and Baby are both home and are doing well. We'll let you know what Baby's name is after his Brit Milah this Monday. There is no need to evacuate any buildings at this time. There are not reports of damage to any campus buildings at this time. I think this is boring, so this is my advise. Run through the streets in a towel screaming "The End of The World Is Here" and "Eureka" because how many other chances will you get to do this. On the other hand maybe he finally got a good place to stand and moved the earth. I now mostly run barefoot somewhat inspired by this article, well really that professor and his research. We use ever more energy to produce food and run vehicles, for example, and spend ever more money on medical treatments when excess food and inactivity make us sick. Link to his barefoot running lab here. Why do I run barefoot? I got a new pair of running shoes - that are pretty rigid - and my feet hurt when I run in them for a while. I thought - "oh I could get one of those neato vibram 5 finger gorilla shoes"
and then I thought "but I want to go running now"
Among other reasons - you can feel the ground with every step you take. It makes an otherwise boring run around a geese-infested lake much more interesting. This is another post about Florida, but not about the Space Shuttle or the trip. This post is about the Cup. While in a hotel in Florida I came across the Cup. This particular cup was nice enough to inform me of the fact that it was in fact the Cup (they capitalized it, that makes it a proper noun and therefor the "Cup" and not just a regular cup). The Cup also alerted me to a number of possible uses for itself. Other uses for this cup: Very Small Hat, Tiny, Megaphone, Plant a Seedling, Build Sandcastles, Collect Donations for a Worthy Cause or Just Reuse It. 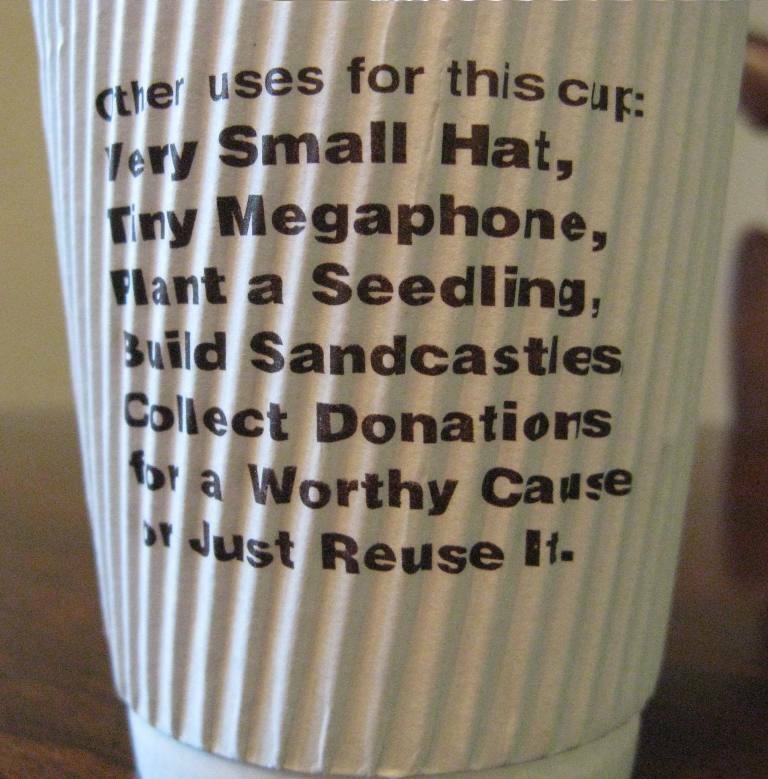 I thought this was very nice of it, I may not have thought of using the Cup for these things. However, I believe it is missing some uses. Drink Holder (well they didn't let me know the Cup could be used like a regular cup), Hamster Bath, Half a Telephone, Small Chair, Very Temporary Lava Storage, Anti Personnel Missile, Cat Traffic Cone (not while being used as a Hamster Bath, that would not end well for Squeaky), Tiny Boat or Micro House. 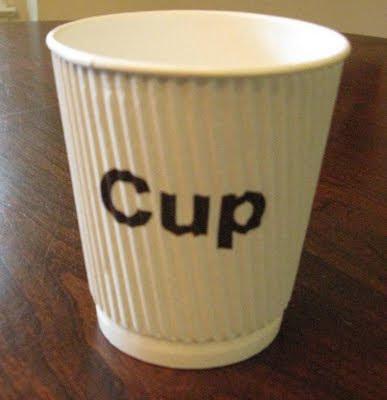 I feel that there needs to be an list attached to the Cup with all possible uses for the Cup so as to prevent any possible lawsuits over lack of adequate information on things to do with the Cup, for it is no regular cup it is the Cup. So I petition the internet to help me compile a list of all the possible uses for the Cup to be attached to the Cup of the future. Legal Disclaimer: Please don't sue me Cup manufacturers of the world! Disclaimer: This map is my current understanding of the situation and opinion. I have changed the map at least once due to some feedback I got. If you think some area of the map should be different - leave a comment! Anyway - once you have found a place to live and move in - what do you do? It was formerly known as Johnny's list of weird Boston events (which is probably exactly what I Googled to find it) and it is also known as "great ideas for a date in Boston this week"
Also - the free stuff he gives away really is free ... I got a free raft trip from Raft New Hampshire. My son is now smack in the middle of the "Why?" phase, made famous by Mindy from Animaniacs. He also asks "How that works?" about many things (the car, a fan, ...) The thing is, as annoying as these questions can be, I don't want to discourage him from asking. And I want to answer him as best as possible. I admittedly have a tendency to answer the questions along the lines of "A dialogue with Sarah, aged 3: In which it is shown that if your dad is a chemistry professor, asking 'why' can be dangerous" by Stephen McNeil (read it!). But, clearly, a nearly-3 year old asking 'how the car works' isn't interested in the details of the internal combustion engine and advanced drive-by-wire technologies, and 'why he shouldn't play with sharp knives' (with 20 followup 'whys') doesn't really want to know all about blood flow and ER copays. So, it occurred to me that I should be scientific about this, and experiment to find out the type of answer he's looking for. So, over the last few weeks I've been asking him "How that works?" and "Why?" and I've determined that these are two very different questions in their meaning and purpose. "How that works?" can be translated to adult as, "How do you use that?" For example, when I asked him how LEGO bricks work, he proceeded to show me how they stack together and how you can make towers and tunnels, etc. So, now when he asks me about the fan, I show him how to use the switch. Or the car, I'll point out the steering wheel and pedals. This seems to be working quite well (he's not driving yet, though). "Why? ", on the other hand, is used purely as a stalling technique or because he doesn't want to listen. It seems that "Because," played after a few real (or fake) answers, is a fairly consistent final answer for reaching the desired "OK, I love you, bye bye" stage of the game. And, it turns out, it's just as annoying to a toddler as it is to an adult. Yesterday was Tisha Ba'av. On Tisha Ba'av Jews fast. This year I decided to try and find ways to make my fast easier by going online and trying to find what the best things to eat before a fast are. This was what I found. Not only was it about whats best to eat before fasting, but Tisha Ba'av specifically. I will call your attention to what was voted as the Best Answer. The day before have a bunch of huge meals. So for breakfast, eat 5 eggs, some toast some bacon, and some nuts. Then have a large snack of nuts (protien!) or have like a milkshake. For lunch have like 2-3 sandwiches with soup and a steak. For dinner have a steak with potatos, rolls, and pasta. Good luck! Just eat a lot of protien, and your set!! Now there are a number of things wrong with this. We will start with the most obvious, Bacon, seriously you are recommending a Jew eat bacon to help him fast easier. Second, Jews have to wait a number of hours between eating meat and milk (varies based on family custom), so having a milkshake for a snack not such a great idea. 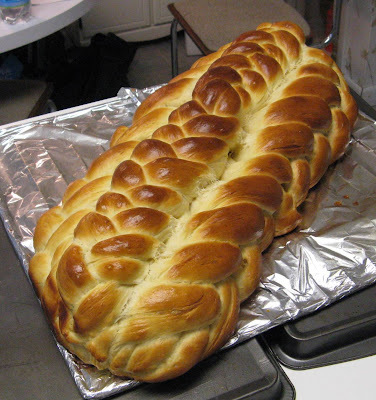 Lastly, many Jews don't eat meat for a number of days leading up to this particular fast. So all in all I think this definitely gets a Best Answer voting if only for its comedic value. This post is very very late ... but consider this getting you excited for the coming winter! 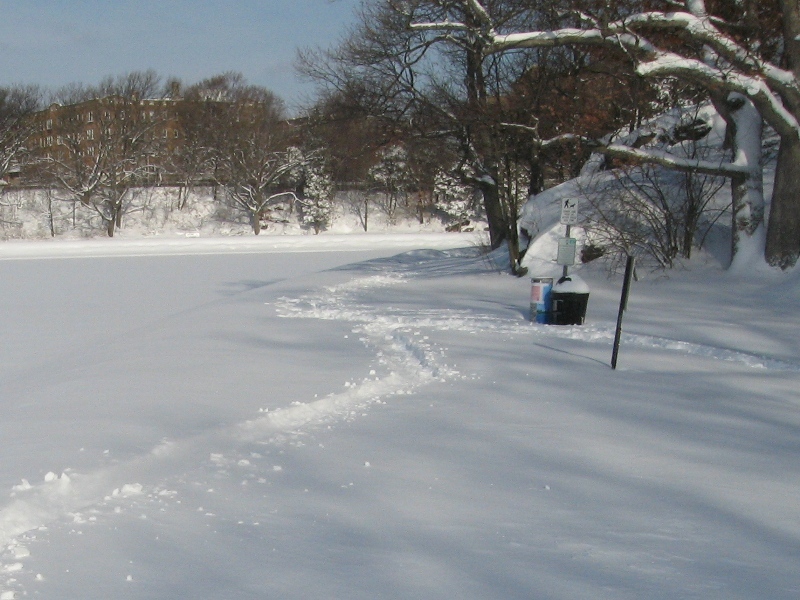 There is this reservoir near me which people walk around - even in the winter. 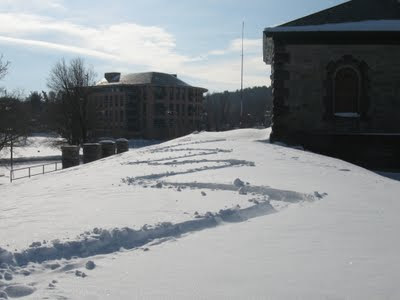 After a large snowstorm worn paths tend to form. How far out of their way will people walk in order to stay on the "path"
No equations yet but it could depend on how steep an angle out of their way the path is heading or how sharply the path turns. It could also depend on the ratio of snow deepness off the path and on the path but this was not investigated. 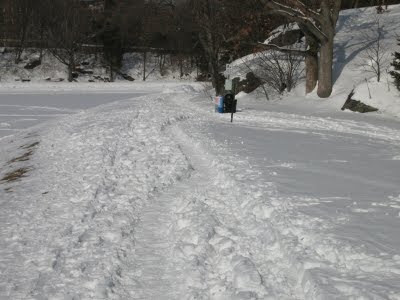 One morning I managed to be the first person to walk the path after a large snowfall. 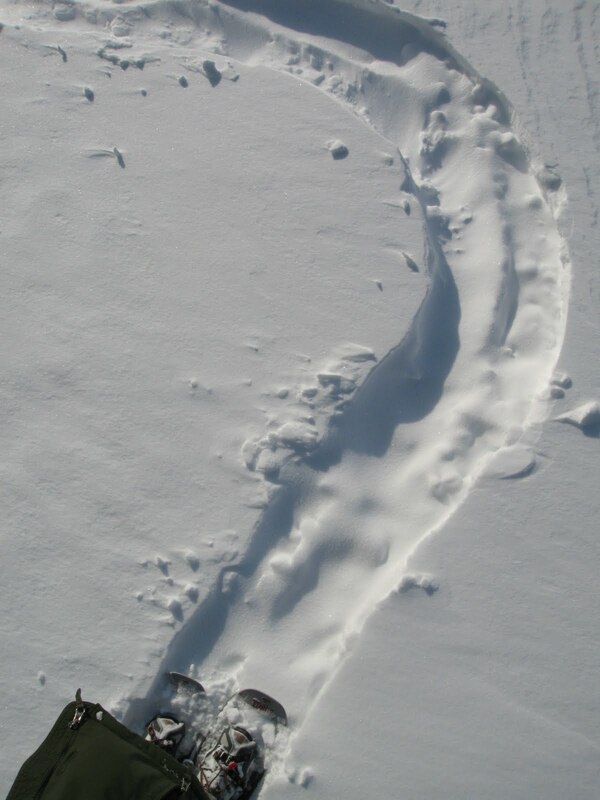 I walked marched in several differently winding paths with my snowshoes until they were pretty worn (see below). I made sure that they had "out of the way" angles slowly increasing, with increasing curvatures as well (sharp and smooth turns). It turns out that the most important measure is the horizontal distance out of the way people will walk. Note that this bend follows my path exactly but they quickly break from it. 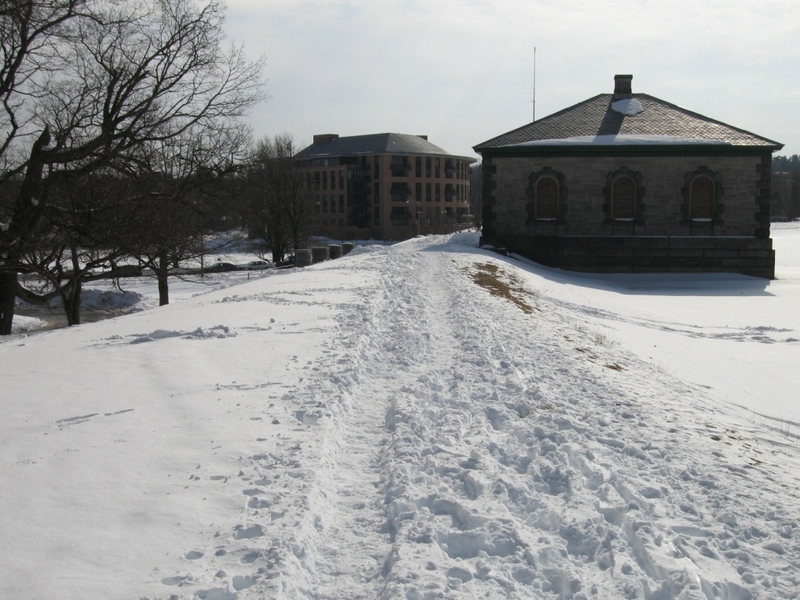 A kind of similar pattern happened below (note the perspective makes these images hard to compare). It turns out that people care more about horizontal distance than anything else in this matter. Also surprising - only the well traveled areas had this effect - in the lightly walked parts of the path, my "experiment" had no effect at all. My guess is that the highly traveled parts were mostly people who needed to get through the snow, but the less traveled parts were walked by people who expected to walk through snow and were therefore more prepared to forge their own path. Automotive science has almost banished the M from the A=M/F (acceleration=mass/force) equation. No car as big and heavy as the Mercedes has the right to accelerate this hard. I love your column (and your new appearance on The Car Show), and I'm sorry for the nitpick, but in your review of the CLS63 in today's paper you commented on automotive science almost banishing the mass term from the force equation. You had the intuition right, but the equation wrong. It should have been: A = F / M. For the same force, a more massive car accelerates slower, while a lighter car accelerates quicker. Otherwise, thanks for keeping your reviews funny and informative. In physics, acceleration equals force divided by mass. An earlier version of this article incorrectly gave the equation as acceleration=mass/force. Yet, no response from Mr. Neil, and no attribution in the Journal. I wonder how many people wrote to him about this. First posted, and blogged in 2006, and updated with another post once it got 1,000 views a month later. As Seen On: The AwesomerAnyway - this link pushed the video to over 100,000 views. A personal record, to put it in perspective all of the pages on this blog have had about 120,000 unique visitors since the time the video was posted. But to put it in further perspective ... this horrible 39 second clip has been viewed almost 200,000,000 times and that is two hundred million times.